There is much else to understand, writes Cypel, who keeps up a running argument with historian Benny Morris and other Israeli intellectuals throughout. One is a massacre of Palestinian civilians that occurred a week after Israel’s declaration of independence; the alleged organizer went on to become the assistant secretary of the Ministry of Defense, and the deaths at Tantura went largely unremembered until a “student historian whose methodology is sometimes faulty and often confused” began to look into the matter. Another point requiring airing, Cypel argues, is the fact that Israeli independence, which came about as a result of UN Resolution 181, theoretically has a twin: The General Assembly recommended that Palestine be divided into two co-equal states, one Arab and the other Jewish, that would cooperate economically. 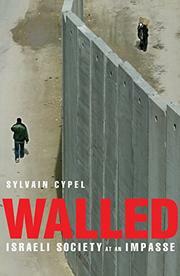 “This resolution,” Cypel writes, “has never, to my knowledge, appeared in its entirety in Hebrew.” It has probably not been widely circulated in Arabic either, and, though he is inclined to blame Israeli intransigence above other causes, Cypel acknowledges that Israeli wrongdoing has often been matched by actions on the other side, such that two fundamentally ethnocentric national movements—both “late on the level of political mentality”—are now dancing together, each wishing the other would disappear. This will likely not happen, of course, and Cypel, like everyone else, comes up short when it comes to offering answers. He is rather better at describing large-scale trends within Israeli society, including ever-increasing Americanization, which some Israelis consider a welcome alternative to old-fashioned Zionism. He is also good when it comes to describing the political failings of Palestinian Authority under Arafat, which did little to improve matters. Partial and polemical, but of interest to students of the Israeli-Palestinian conflict.